Oh, the places you'll go to in the amazing 2020 Coachmen Catalina Summit 172BH! You can find this reliable Travel Trailer at All Seasons RV, located at 4701 Airline Rd Muskegon Michigan 49444! Not only are we one of the largest RV dealers in the Midwest, but we're also #1 in customer satisfaction! The proof is in the pudding, so give us a call today at 231-739-5269! 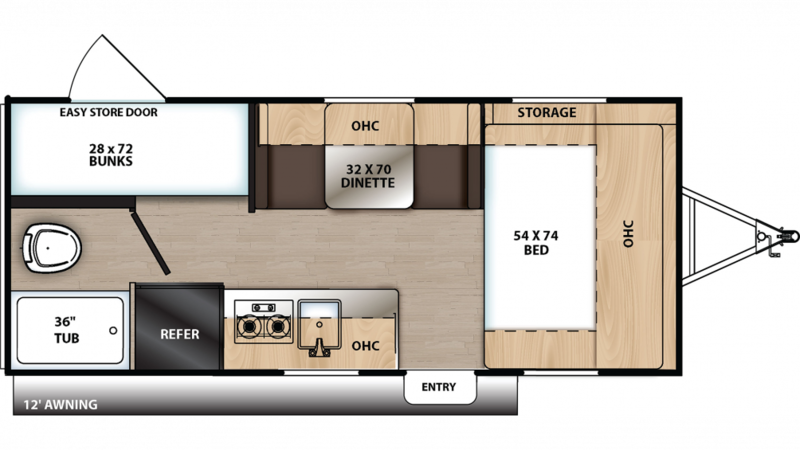 The handsome 2020 Coachmen Catalina Summit 172BH is easy to tow and ready to go, thanks to a hitch weight of 336 lbs. and GVWR of 3836 lbs. The easy opening 12' 0" patio awning provides comfort and shade for relaxing outdoors! Avoid fast food joints with home-cooked meals in the kitchen, with its 7.00 cu. ft. refrigerator and a 2 burner range cooktop. The 33 gallon freshwater tank provides the sink with clean drinking water. You'll have exclusive access to a Marine Foot Flush toilet and a shower anywhere and anytime, thanks to this model's full bathroom! There are lbs. of LP tank capacity providing heat, so your showers stay hotter for longer! The 25 gallon gray water tank and the 25 gallon black water tank help you avoid dealing with waste and used water while you're having fun on the campground! When it's time to turn out the lights, everyone can enjoy a comfy night's sleep with the roomy bunkhouse and its Bunkbeds! Kids or guests will experience sweet dreams!